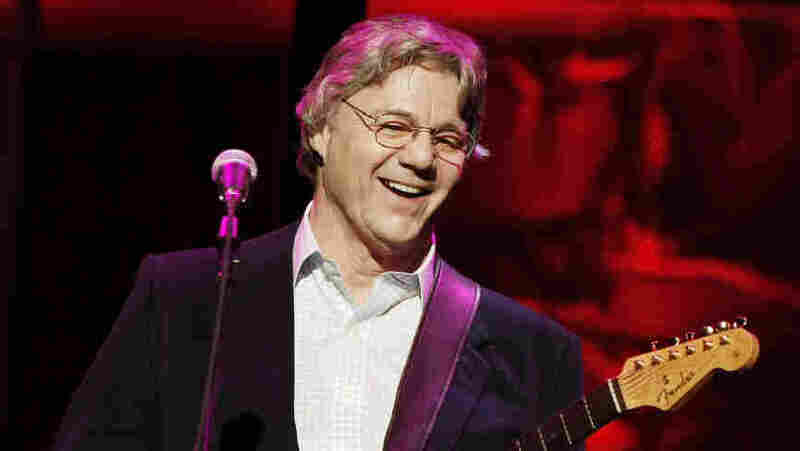 Vintage Cafe: The Steve Miller Band : World Cafe The "Space Cowboy" sits down for a lengthy interview with World Cafe host David Dye. Some people call him space cowboy, some people call him the gangster of love, but most know him as Steve Miller, the guitarist and vocalist whose laid-back, infectiously catchy tunes have soothed the nation for decades. Miller honed his chops as a Chicago blues musician in the early '60s and then moved to San Francisco to form the Steve Miller Blues Band. In 1967, they performed alongside Janis Joplin, Jimmy Hendrix and Otis Redding at the storied Monterey Pop Festival, the event that brought many important artists of the era into the national spotlight. Steve Miller's group was among the lucky ones. Following their appearance, they signed to Capitol Records and dropped the "Blues" from their name at the label's behest. Throughout the '70s and '80s, they recorded memorable FM radio hits of like "The Joker," "Fly Like an Eagle," "Rock'n Me" and "Abracadabra." In the years that followed, the band continued to tour, but their recording output slowed. In 2010, they released Bingo!, their first studio album in 17 years. On Bingo!, Miller returned to his blues roots, covering classics by B.B. King, Howlin' Wolf, Otis Rush, Jimmy Reed and others. They released a follow-up this April called Let Your Hair Down, featuring new takes on songs by Muddy Waters, Robert Johnson and more. On this episode of World Cafe, Miller Band sits down for a length discussion with host David Dye about the group's past and future. This World Cafe performance originally aired June 9, 2011.